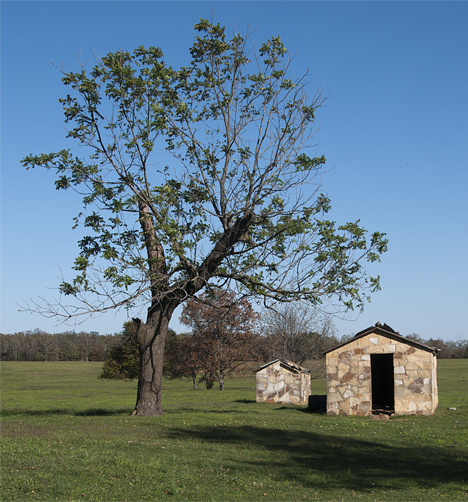 I could not find anyone who could give me information on these buildings at Hickory Flat, Arkansas. The larger one strongly resembles some jails I’ve seen. I absolutely haven’t a clue about the smaller building. Hickory Flat was as flat as a pool table but I spied no immediately recognizable hickory trees. So much for batting .500. 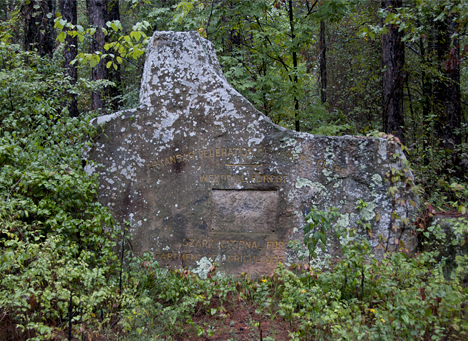 Up in the hinterlands of north Arkansas, toward the Ozarks, years ago, rocks (now more fashionably called “native stone”) were a popular building material. You see can still see examples of rock commercial buildings and rock houses in small towns and rural areas up there. There was a lot to be said for rocks. There were plenty of them and for the most part they were free, depending on where and when you harvested them. Think of the great outdoors in that case, as Home Depot or Lowes with no checkout stands — substituting sweat, grunts, groans, and sore backs as the currency of choice. 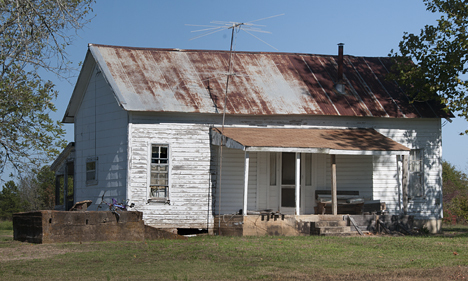 Before we delve further on this rocky road, we suggest you go to the Photo of the Week page at Corndancer dot com where this trip started to see a fine example of another historically popular residential structure style, a dogtrot house at Cleveland, Arkansas. There’s enough of it left to give you an idea of how things were. We’ll wait here while you take a look at this old structure from several angles. Here’s a second look at the old Hickory Flat rock buildings. The small window has heavy hardware cloth and no glass. There is a big hole in the hardware cloth. Was someone breaking in — or out? 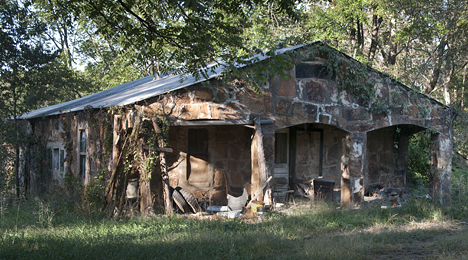 Further west, I found this no-longer-occupied rock house, north of Hector, Arkansas, way back in the boondocks. The structure appears to be in relatively good condition. After all, short of impact or explosion, what’s going to hurt a rock? It’s been a while since anyone lived here, but the old house appears to be in pretty good condition. At least from the outside. Looks like a good place for old tires and other unneeded stuff one is not yet ready to finally jettison. Here’s another rock house, with evidence of an architectural style that emerged in the late forties and fifties, the “picture window.” You don’t see many rock houses with one of those. Notice the cut wires for electrical service at the roof line to the right. The house is on Highway 110 southeast of Heber Springs. It has a big ol’ home-place tree in the back yard. This old house demonstrates a masonry work-around: If you run out of rocks or don’t have the right size or shape, make yourself a rock out of cement. Take a look at the bottom of both sides of the front porch. 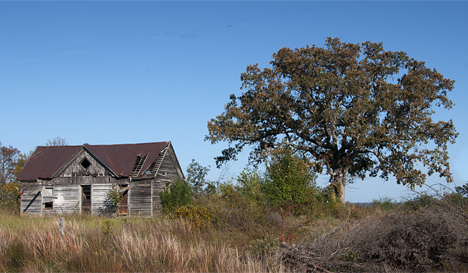 I found an old dogtrot house on Highway 110 southwest of Heber Springs, Arkansas. As with most surviving dogtrots, the breezeway was closed to make another room, basically a historical no-brainer if you needed additional enclosed space. This one has a nice old “home-place” tree and an in-ground storm shelter to boot. A great place for spiders and bugs. Like most dogtrot houses occupied for the long term, the dogtrot breezeway on this one has been closed to make one or more additional rooms. The old home place tree tells us that both have been around a while. In the next picture, you see evidence that someone is repairing the old home. There is a concrete form set up on the right hand side of the porch and a couple of QuickCrete bags on the front port bench. And, one of the porch columns has been replaced. Perhaps this house will survive. At a slightly different angle you see the in-ground storm shelter which makes an apparent final resting place for a bicycle skeleton. Also, you can see the add-on at the back of the house. 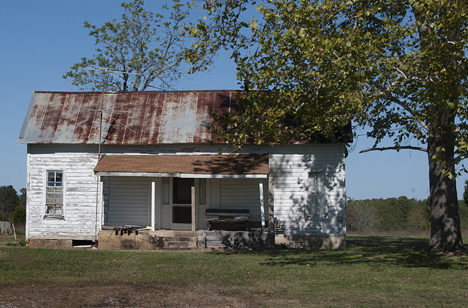 There’s hardly a surviving dogtrot that does not have one or more additions. This old residence has a storm shelter which looks like a mini-turret from the Maginot Line or the Nazi Atlantic wall of WWII fame and/or infamy (one failed miserably, and the other was a creation of the bad-guys). The house has long since been unoccupied and there’s no telling what awaits one in the storm shelter. The storm shelter at this long abandoned house on Highway 25 way north of Heber Springs resembles a WWII “pill-box” fortification. Long abandoned, it is probably home to a full compliment of creepy-crawlers. Not far from the pill-box storm shelter I spied the sun-illuminated roof of this old barn. I ventured an inquiry to the residents of the property. I parked in the front yard and headed to the back door as any self-respecting Southerner will do. When I exited the truck a large dog rounded the corner headed my way. I believe he is part German Shepherd, part Mastiff, and part Tyrannosaurus Rex. 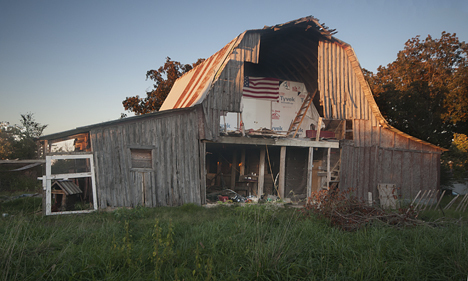 The old barn in Bud’s yard shows some signs of recent attention. Perhaps it is a lofty man-cave under construction. The Red, White, and Blue lets others know where these folks stand. While there are miles to go before they sleep on this renovation, these folks have made a start — which is more than can be said for most of the old barns I see. The late afternoon October sun lends a nice touch to the scene. As the giant approached, I extended my time-honored greeting to strange dogs, “Hey Poody-Pood, what’s happenin’?” To our mutual good-fortune, he interpreted my kindly proffered greeting in the spirit in which I extended it. His Louisville Slugger size tail began to flagellate. Before I could take another step, his front paws were just shy of my shoulders and I received a face-full of his favorite greeting. I made my way to the back door with my requests. The residents gave me the boy’s name as I sought dispensation to photograph their barn. His name is “Bud,” and I got reluctant approval to make my pictures. Unfortunately, Bud was such a moving target, I did not get a picture. When I Google “Home Place Tree,” the first reference is to that term in a story I wrote earlier. That said, I suppose I can lay claim to the term. Those of you who follow these posts have heard the term more than once. The truth is you see more home place trees all by their lonely than you do with the home to which they supplied shade. In this case, the home is still there, but on its last legs. Sooner or later, you will see only the tree, so take a good look at what’s left of the original arrangement and use your imagination. Many, many older rural home owners always left a tree or two close to their residence, hence my coined term “home place tree.” Here is the original arrangement. The tree will no doubt outlast the home. 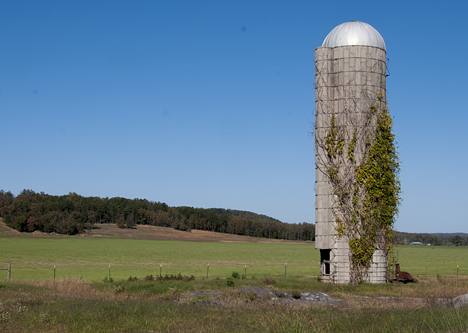 I recently lamented to Ebenezer Bowles, the chief cook and bottle washer at Corndancer dot-com, that I longed to see a silo in my view-finder. The Almighty must have taken notice of the conversation. In His Divine bent to take good care of fools and drunks, He put in front of an unused, but nicely preserved silo in a perfect setting and perfect light. I submit the image as prima-facie evidence that Divine intervention is alive and well. This great silo is west of Highway 16, south of Pangburn, Arkansas. 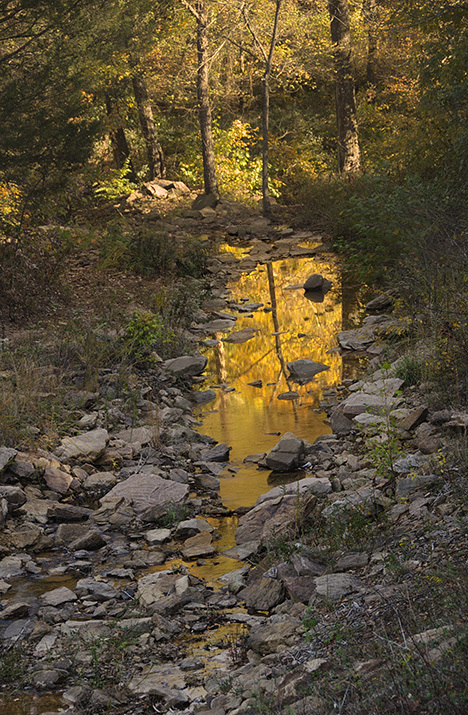 For a few minutes, this pool in a small stream crossing Tiger B Road in rural Cleburne County, Arkansas was shimmering in the brilliant light of a late October setting sun. Finding it was a happy accident, enhanced by sticking one’s nose in an area where it might happen. My dear friend and world-class photographer W.L. “Pat” Patterson has a pat (heh-heh) answer for those who lay eyes on his fine images and fling a question at him something like this — “How do you get pictures like that?” — He quickly retorts, “Oh, just be there and about f8.” He reveals this advice in the correct order. The first thing you have to do is be there. After spending an afternoon driving all over the Arkansas countryside to the south and east of Heber Springs, Arkansas, I was inching into the “golden hour” when the sun dips low in the west and coats everything it can see with a gossamer film of well, gold. I needed one more good shot and took Cleburne County Road “Tiger B,” hoping for the best. (I haven’t a clue how they came up with that name). The map showed it to be twisty and hilly, both of which portend well for late afternoon photo-ops. Toward the end of my trip on the road, there it was. A pool in a small stream in a shadow, reflecting the foliage behind it which was in the bright sunlight. Visually delicious. And that, my dear friends, is the sum and substance of Weekly Grist this week. (it’s been a long-long day). Bottom line, I followed Pat’s advice again and it worked again. Earlier in the day, I shot the Arkansas Highway 110 Bridge over the Little Red River at Heber Springs — No hunting required, drive down the highway and there it is. Instant scenery. Go there and see what belongs on a postcard with your very eyes, or see more of the bridge and mountain on the Photo of the Week page at Corndancer dot-com. While the trip is worth it, clicking on the link can save airfare and/or gas — and a wad of time. 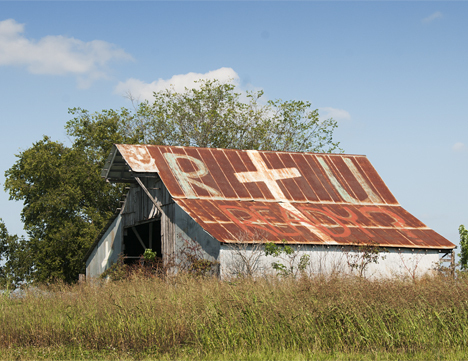 As you cruise into the outskirts of St. Vincent, Arkansas, you notice an aged reminder of Redemption, or the lack thereof, on the roof of this old barn. Back in the day, barn roofs were convenient substitutes for billboards, most of which were painted by itinerant sign painters. This roof was not painted by one of the traveling practitioners. It shows all the vestiges of creation by a non-professional painter with a passion to deliver a message . Whomsoever did the deed had a better eye than most amateurs for proportion and layout. The message is on both sides of the barn and clearly shows in the Google satellite view of the location. 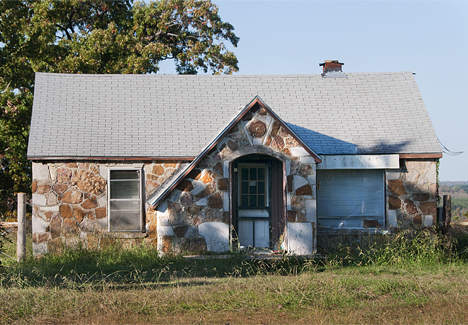 Not far up the road from the barn is St. Vincent’s business district, consisting of one store, LBJ’s Beer and Grocery. In Arkansas, some might consider the two a culture clash. 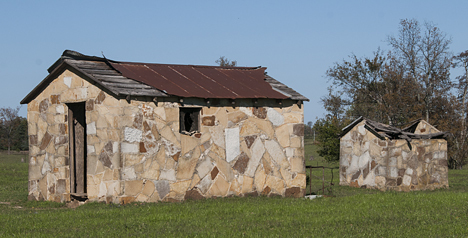 Unlike the old barn, there were people present at LBJ’s which seemed ripe for a good story. That presumption of a good story was correct. See the story of LBJ’s Beer and Grocery — and its proprietress on the Photo of the Week page at Corndancer dot-com. We’ll wait here for your return. 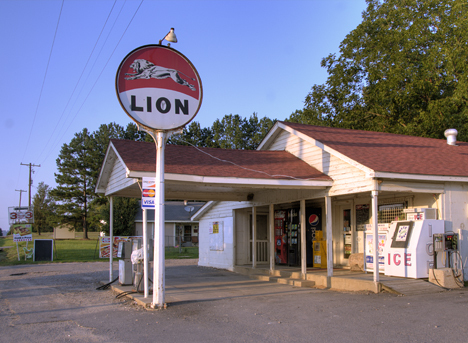 Later that afternoon, we found this store proudly displaying an old Lion Oil sign. Lion Oil is an Arkansas company which has changed hands over the years. The Lion Oil refinery in El Dorado, Arkansas, you can be assured, is refining crude even as you eyeball this image. A day later, we headed back in the same direction.The fine sunlight of the preceding day had transmogrified to overcast and liquid sunshine. I decided that these conditions did not create gloom and doom, but offered different challenges. 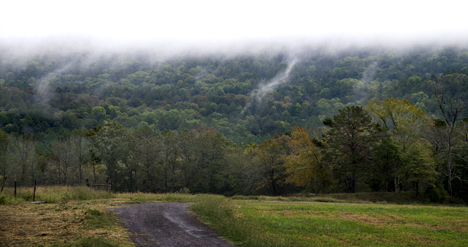 As we were ascending to the hills, cold rain hit warmer earth and foliage creating a misty mountain mystique. It didn’t last long. 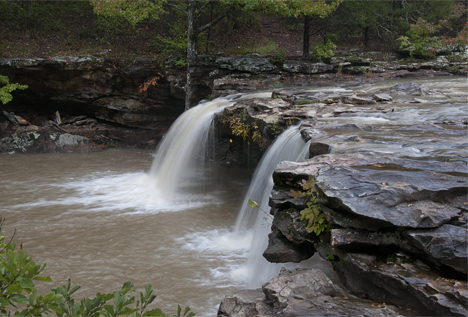 Once the mental re-orientation was done, I headed nearby to one of my favorite waterfalls, Falling Water Falls, (on Falling Water Creek) northeast of Ben Hur, Arkansas. 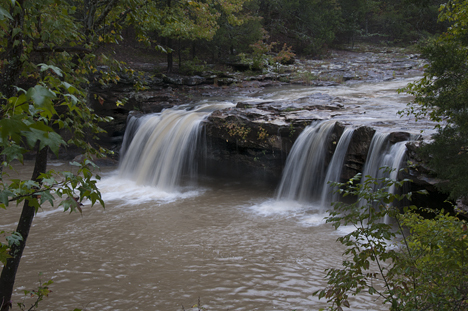 The normally pristine falls were a bit murky due to the extreme drought in this Arkansas neck of the woods. The creek drains a lot of downhill territory which contains a lot of dust resulting in the coffee look of the falls. The dusty grunge however does not diminish the siren sound of falling water, which is mesmerizing to a lot of folks, Me included. It is not necessary to leave your vehicle to take in this view of Falling Water Falls on Falling Water Creek, northeast of Ben Hur, Arkansas. The murky appearance is an anomaly. The creek normally runs clear and clean, however, the accumulation of dust due to the current drought in the runoff area that feeds the creek creates the temporary appearance. It is necessary to leave your vehicle to get this view. A few non-hazardous steps will do the trick. I identified Falling Water as one of my favorites. Here are links to my previously documented visits to the falls, the first of which goes way, way, back to the film days: Falling Water 1; Falling Water 2; and Falling Water 3. Apparently someone decided that the memorial, which stands taller than my 6-3″ frame was no longer necessary. Perhaps there is some irony in the fact that the memorial bears a striking resemblance to the map of Texas, our former Southwest Conference arch-rival. Perhaps the monument was abandoned because it looks too much like Texas, our former arch- rival in the now defunct Southwest Conference. Further north on “Old 27″ I found this old rock fence. Folks, there is no easy way to build one of these. Here are the instructions: Find rock, lift, tote, lower in place. Repeat if necessary. Multiply that by the number of rocks you see, keeping in mind that this is a fraction of the fence. 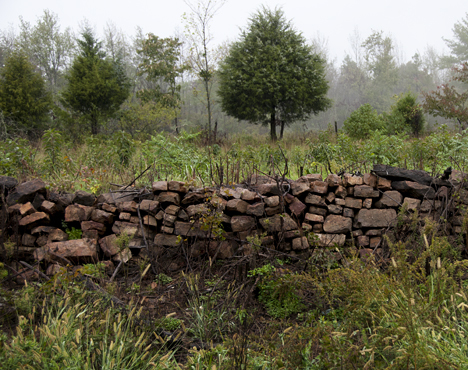 Imagine the labor to build in this old rock fence. Apparently our fore-bearers believed there was great value to these structures. Back in the boondocks, one frequently encounters fences that strongly resemble this one. 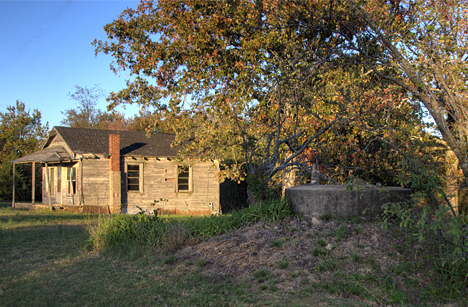 Across from the rock fence is an old residence which appears to now be a deer camp. The old dug well looks good in the front yard. Since there are no ropes attached, one can presume its primary function is now decorative. 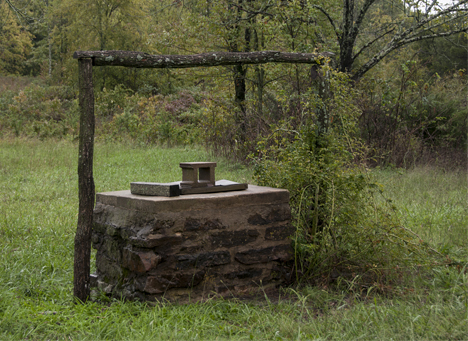 The old dug well structure across from the fence is well preserved, but non-functional. The cool stuff to see does not go away during inclement weather, it just looks different and may be a tad more difficult to reach. But, if you don’t go you’ll never know. This skeleton was once a barn/residence combination under one roof. Fortunately, a breeze way separated the critters from the family. It is probably the most primitive structure I have discovered in my ramblings. Four years ago, in the boondocks near Scotland, Arkansas, I rounded a curve on a remote gravel road and found this amazing structure. It was easy to tell that it was once a home and a barn under one roof. It did not take much imagination to figure out that life was tough if you lived there. Find out more in our original post from October 10, 2008. Also be sure and check out our original story on this place at Corndancer dot-com. We will have a new story for you next week. In the meantime, I believe you will enjoy looking at this unique structure. By the way, for what it’s worth, this is the 200th Weekly Grist post. We also have a new picture on our Photo Manipulation page; seems a couple of women tried to come between a couple of guys. I fixed it painlessly.